Greetings everyone and welcome to June’s issue of Synchronized Chaos Magazine! Wishing you a happy graduation and a lovely Father’s Day, and celebrating the change of seasons with a burst of creativity. This month, our contributors reach deeply into their knowledge and backgrounds in order to uncover and bring back glimpses of what is beyond personal or collective experience. Together, they present hints of a world beyond our grasp, intimations of the unknown. San Francisco State University’s Personalized Medicine: Targeting Cancer workshop explores physical unknowns related to medical research, positing that by understanding and classifying individuals, we can put all the pieces together to construct a view of the larger biological picture. Returning essayist Cynthia Lamanna also works to understand human life by moving from the specific to the general, developing a colorful, detailed description of various roles a mother might play in order to uncover and convey the overall concept of motherhood. Visual artist Mariya Milovidova subconsciously develops her pictures in a similar way. She draws upon and incorporates diverse sources of inspiration, from her Eastern European heritage to nature and today’s current events, into a cohesive style somewhat reminiscent of Marc Chagall – warm and comforting, but with a hazy, faraway transcendence. Her fellow artist Marconi Calindas, the ‘Happy Artist,’ also reflects various geographical influences in his work, celebrating the Pacific Islands and the San Francisco Bay Area through paintings which blossom with vibrant energy, honoring pride, home, and family. Self-described as popular among Russian and Japanese tourists to the Mariana Islands, Marconi and his work can be conceptualized in a positive sense as appealing to people curious enough to travel and see out-of-the-way places for themselves, and providing them with a glimpse into various cultures and our common humanity. Opera San Jose’s production of La Rondine (The Swallow) bursts into life along with Marconi’s paintings, replete with roses, sunlight, laughter, and parties. Romantic courtesan Magda experiments with the unknown, attempting a trial run of the home and family life denied her as a kept woman, and becomes stronger through the bittersweet end of her rendezvous. Mixed media artist Stephen Mead’s work also emerges from personal experimentation, as Mead develops ideas about intertwined global spiritual truths and respect for other life forms organically, while he works with various materials. He’s figuring out the nature of the metaphysical universe right along with the technical properties of oils, glazes, and acrylics, excavating everything as if from a child’s treasure chest. Returning artist and writer Reuben Rutledge openly honors the power of art to permit creators and viewers a glimpse into truths beyond our daily existence. As we follow our creative paths wherever they might lead, surrendering to and serving our artwork and our calling, we become participants in the sacred and the sublime, and begin to comprehend the mystery and grace held within even the most ordinary objects and places. Yet, even after many years of mastering his craft, Rutledge acknowledges the limits of our present human knowledge of higher truth. He illustrates this visually through manipulating his photographs to obscure distracting detail and draw attention to the shimmering, joyfully divine essence of the subjects, and dedicates himself anew to the quest for beauty and meaning. Returning Christian devotional writer Patsy Ledbetter also admits to our limited knowledge of our world, and illustrates how we may draw upon our potential ignorance as a source of encouragement. Struggling as a substitute teacher, she has little idea of the impression she’s making in the life of a student, who will remember her much longer than that school day. We often find it difficult to understand ourselves and our own motivations and desires, much less outside reality. Hawaiian comic artist Kit Fox renders her personal artistic journey through her black and white strip, intentionally appropriating a ‘cute’ childish sensibility and style of humor. This, combined with Fox’ unassuming self-mockery, and the realistic curves on her human and animal characters, creates a warm, human sensibility which opens viewers up to her relatively honest psychological exploration. Novelist and professor Kate Evans also grapples with self-discovery in her new release Complementary Colors, where the protagonist discovers her need for deep personal and intellectual intimacy with another human being while acknowledging her romantic interest in another woman. The heroine, Gwen, learns not to fear the Merge – becoming truly close to someone else – and to honor and nourish her inner hunger to be understood. 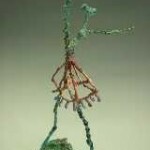 Ilana Davis describes her work in various artistic media as a kind of ‘merge,’ a physical extension of her thoughts, and as a conversation where she responds to her experiences by creating metal and clay figures. Categorizing various materials in terms of their technical possibilities and limitations, she sublimates ideas and emotions into physical objects. Striving for aesthetic grace, she renders intangible concepts more comprehensible, bringing us varied glimpses into a more abstract world. Sculptor Kathleen A. Ball joins Davis in reaching into the unknown, exploring ancient peoples, technologies, and scientific and cultural value systems. Ball researches and harnesses historical and contemporary, multicultural ways of knowing and describing the world so that those modalities of conceptualizing our universe will gradually seep into her artwork. Creating a figure from a certain time period is an entire philosophical process of entering into the worldview and thought processes of the time to make her work ring true not just technically and anatomically, but in spirit and feel. While organizing the Beauty Expo, the people of San Francisco’s Fashion and Merchants’ Alliance and Pigment Cosmetics also consciously sought to draw upon and integrate various ideas and art forms in order to approach a conceptualization of beauty. Specifically designed to showcase and spotlight the work of makeup artists and hairstylists, the event celebrated fine artistry which worked with and built upon nature. Organizers incorporated poetic and visual illustrations of beauty into the event’s blog, connecting fashion and design with the broader stream of aesthetic work towards discovering and creating the sublime and building upon the unique strengths of each modality of expression. We at Synchronized Chaos welcome you to this month’s journey into the lesser-known aspects of our world, and wish you the best as you peruse our many offerings. Thank you very much for the privilege of sharing in your own creative journeys. I was born in Odessa, the beautiful city in Ukraine by the Black Sea. I started drawing when I was two years old. Music, books, movies, fashion, people and nature inspire me to create new works. As I walk through life I create what I feel, see, hear or smell. The rest, I leave to the viewer to interpret any way they feel. Marconi Calindas, a journalist and writer by profession, is making waves in San Francisco City and around the San Francisco Bay Area. He has graced invitations to display and exhibit his works at the Bayfair Mall in San Leandro and Newpark Mall in Newark. He is set to hold group shows at Aspect Gallery, Sudachi Restaurant and San Francisco City Hall Office of the Supervisors. He also has been invited this year to display his Mariana Art at the House of Representatives on Capitol Hill. 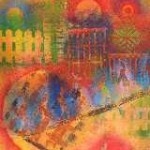 He also has invitations to showcase his unique and colorful art at the University of California, Berkeley and a high school in Orlando, Florida in 2010. Marconi Calindas continues to work on more paintings to showcase the beauty of San Francisco and the Bay Area and the world around him. Marconi’s art has been popular in the US territories of Guam and Northern Mariana Islands as his clothing line Wear-A-Marconi™ (www.wearmarconi.com) since 2007. He translated his art onto shirts that depict the beauty of the islands. His works have been published on popular magazines and newspapers in the Pacific and as far as Japan. The Japanese and the Russian tourists of the islands have been the major fans of his work in the islands. For more information about Marconi’s art you may contact him at marconicalindas@yahoo.com. Art is the freedom to express your thoughts and feelings. Spontaneous creative freedom is expressed through the art of sculpture where the only restraints are technical, according to the medium. 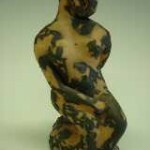 The elasticity of clay generates an immediate relationship and flow of ideas. Feelings can pour, unrestrained, directly to the medium; the clay becomes a tool through which the artist’s feelings and soul become tangible. Creation with metals is rigid and powerful, which compensates for clay’s shortcomings. 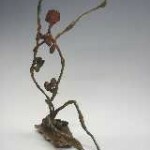 With recycled scrap metal it is possible to create independent and immediate sculptures, free from supports. However, work with metal must be more premeditated and the free flow and connection with the medium is limited. Sculptures are an extension of reactions to daily life, and reality is translated through figurative abstract sculpture. The influence of everything from books to current events to music is translated into solid expressions. Even somber ideas are presented aesthetically; illustrating that in pain there remains an outlet of beauty. 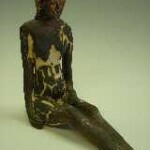 Ilana Davis may be reached through her website, http://www.mysculptures.com or at ilana@oran.com and welcomes discussion and networking with other artists. My work is the physical expression of my life’s experience. I have been an artist since a young child, working in a variety of media from bronze, glass, ceramic, oil and acrylics and neon among others. I began as a sculptor at the age of seven and returned to my primary medium at thirty-three. After half my life as a mural painter, portrait painter, silk-screen printer and interior designer I found myself returning to my first love, sculpture. Working in ceramics, both basque-relief and three dimension eventually led to bronze. I have been working primarily in bronze and clay for the past sixteen years, creating portraits, installations and basque-relief sculpture for private, and public commissions for patrons throughout Northern California, Canada, Europe and New Zealand. Currently, I have been chosen as a finalist to complete a commission for Emanuel Medical Center. I will be sculpting a nine-foot bronze angel for the entrance of their new hospital wing. In addition, I recently completed a portrait of Henry Seishiro Okazaki to be presented at the National Karate Ceremonials. I have been exhibiting works of art for the Foundation of Higher Learning since 1995, creating basque-relief and wall installations for several of their international retreat centers. For private commissions involving portraiture, I begin the process by getting to know my subject in terms of expression, character, personality and mannerisms. If my subject is deceased or an historical figure, I gather research and photos from family, friends and a variety of sources prior to the actual execution of the sculpted figure. I like to capture the “essence” of my subject in the final work of art. When completing a portrait of Leonardo da Vinci for Mario and June Biagi (Biagi Vineyards) in 1994, I first researched the life of Leonardo before deciding on a rendition of him in his later years, while living in Southern France with King Francis l. The final work included a portrait of Leonardo in his chateau, (which was connected to the King’s castle by an underground tunnel), where he spent his final days conversing with the King, surrounded by his few possessions including, The Saint John, The Mona Lisa, The Cellini Salt Cellar and twenty-two of the most current books in science and religion, a Bible and his famous note books. To supplement my work as a professional artist I am currently teaching art at Columbia College and have taught in several other College institutions in the greater Sacramento and Foothills area, elementary schools and privately for the past sixteen years. I am currently completing research for consideration of a doctoral degree, comparing quantum physics, world-wide spiritual belief systems and the evolution of human consciousness. I hold a Master’s of Fine Art degree from the Academy of Art College in San Francisco, a Bachelor’s of Fine Arts degree from the Union Institute and University, in Studio Art and Multicultural Studies which included in-depth archaeological research and field studies. 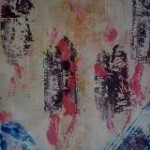 In addition, I have a background in Fine Art and Human Services at the Associates level. I moved back to my studio and home in the Sacramento Foothills in 1998 after three years of working, exhibiting and maintaining my studio in San Francisco. While in San Francisco, I completed my two largest installations, “Union” and “Transfiguration l”, which I aspire to exhibit internationally. Each of these has involved a four to five year process of research, material exploration and finally, completion of the body of work which is then installed in a gallery. Each time these works have exhibited, they have undergone a transformation. My background in interior design has been vital in understanding how the artwork should feel in its intended space. It must meet the needs of the location in terms of interior/exterior media, architectural design, intended viewer, lighting and color in the existing space. 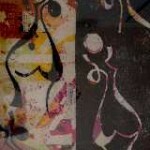 What may be appropriate for one space can be completely different in another while still using the same works of art. Meeting the needs of my client, the space intended and the media required is the challenge that continues to keep me creating art. Every new creation is a unique experience in which I relish. My personal endeavors include continued research in the various esoteric and ancient belief systems or our planet, quantum physics, neurobiology, cosmology, anatomy, biology and other natural sciences and their connections to our existence. My interpretations of these subjects are the concepts I convey in my installation works. Currently I am conducting a comparative study of the Lost Books of the Essenes and Candace Pert’s research for her book “Molecules of Emotion.” A Synthesis of these will be expressed in my next installation sometime in 2006, entitled “Transfiguration ll.” My life has become a continual manifestation of the art I create. It is more than what I do, Art has become who I am and how I communicate to the world. Kathleen Ball may be reached at kballadonai@yahoo.com and welcomes the chance to network with other artists and interested viewers! As the common adage goes, cancer is not just one disease, but more like millions of individual conditions. If research continues along the directions many of the scientists speaking at San Francisco State University’s annual Personalized Medicine 3.0 conference predict, a cancer diagnosis may initiate a journey through a medical flowchart. Patients, geneticists, and oncologists will examine a person’s DNA makeup for thousands of possible variations which may affect the severity of his/her disease and the likelihood of its responding to particular pharmaceutical formulations. Dr. Michael Goldman, chair of SFSU’s biology department, highlighted this emerging concept as the event’s theme while attendees enjoyed a luscious healthy fruit and pastry feast. Soon afterwards, David Duncan, author of Experimental Man and director of UC Berkeley’s Center for Life Science Policy, regaled us with tales from his genome. Duncan paid for complete analysis of his entire genetic makeup, which proved that he was basically healthy except for a predisposition to heart problems if he continued to gain weight. Responding to this news by losing ten pounds, Duncan advocated the potential positive consequences of learning more biologically about ourselves. Other researchers continued the trend of linking basic science research to practical and clinical applications, including Dr. Steven Anderson, chief scientific officer of Monogram Biosciences/Labcorp, who took part in a panel discussion on diagnosing cancer. Anderson discussed mutation profiling of the DNA of cancer tumor cells to determine exactly which genes were altered or under/overexpressed in a particular person’s condition, with the pathology of four basic subtypes of breast cancer as an example. As a leader in the molecular oncology field, he helped develop many of the diagnostic assays making this level of genetic analysis possible, relying on molecular biology and immunology methods which identify mutations and gene expression levels. Another panel speaker, Dr. Jeffrey Lawrence of Roche Molecular Systems, related how the pharmaceutical industry now works towards coordinating the development of diagnostic tests for one’s cancer subtype with the production of a specific medicine for its treatment. Also, Richard Shippy of Affymetrix, described new microassays which can detect the presence of certain alleles (particular forms of a gene) to identify a potentially pathological loss of genetic diversity in a patient’s cells. And, finally, just before lunch, Dr. Jerald Radich of the Fred Hutchison Cancer Research Center elucidated methods of determining the likelihood that a patient’s acute disease will return after a period of remission. The research he referenced held implications for metastatic melanoma skin cancer and acute myeloid leukemia, two types of cancer where medical science still has a long way to go when it comes to improving long-term survival rates.